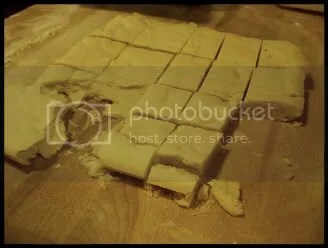 After my previous shortbread fiasco, I was going to try a recipe I found for Scottish shortbread on About.com. Not normally where I would go to find good recipes, but I was desperate. My most ‘reliable’ cookbook at the moment is Barbara Tropp’s The Modern Art of Chinese Cooking – not exactly a hub of baking perfection in this situation. But then one evening, 354 and I ended up in Barnes & Noble, and I got a wild hair. I went to the cookbooks (after a fruitless search for decent dog training books) and found a copy of my favorite fallback instruction manual. 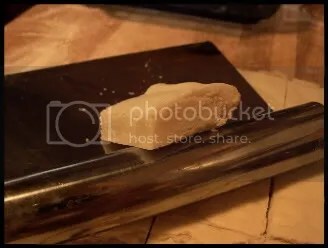 I sat in the aisle and recorded an annotated version recipe for shortbread on the back of a business card, the only piece of paper I had available to me at the time. I felt guilty at the time, like I was shoplifting at the bookstore and that an employee would come up behind me at any moment and ask me politely but firmly to leave the store. Thankfully, none did, and I made a test batch of shortbread that very evening. I’m so glad that I shoplifted this recipe. The shortbread was everything I hoped it would be. The annotated recipe is below, with notes to explain what you should be looking for. What can I say – I was in a rush to escape the wrath of B&N employees. Those bookstore folks, they can get pretty testy. Questing for the right shortbread. I grew up with one type of shortbread at one time in the season. ‘Daddy Bob,’ patriarch of my mom’s best friend’s family, made shortbread every Christmas season. It was buttery, super rich and sweet. It flaked just right in your mouth, but it was cakey, too. There was nothing to it, but the recipe is still a secret. It makes me think of Christmas at home every time I think about it. So for Operation: Baking GALS I wanted to send a part of home over to the Marines on a float, but I had no recipe from Daddy Bob. I would have to make my own. Generally, I’d go to the Joy of Cooking, my catch-all resource, but it’s at Momma’s and that’s two hours away and she’s sick. So I had to search. Would you believe the amount of shortbread recipes there are on the Internet, with no accompanying pictures? Unbelievable. I decided to try the perfect shortbread recipe from bread & honey. It looked like the right thing. It really did. And in the right context, probably with smaller pans (shortbread tarts, anyone? ), it would probably have worked. Not in this case. Don’t get me wrong – it was good shortbread. But good shortbread for something other than just plain shortbread. More like a short dough type shortbread, which I nonetheless love. It was fall-apart flaky and melt-in-your-mouth, naturally. It was good. But it was also a little too dry for my taste, and a little too flaky to hold up in transit. Given, I did double the recipe, and I didn’t have any rosewater, so I had to add plain water – much more than I thought I’d need, as in a whole teaspoon (as opposed to the half teaspoon I should’ve needed). The dough came out lovely, though, and it kneaded quite well. It was elastic and smooth and it pressed down well, held its shape in the pan. It even cooked pretty, the way I think shortbread should come out looking – golden around the edges and bottom, but barely cooked (to the eye) on top. It came out nicely, I was proud, and it cut cleanly. But it just wasn’t what I was looking for this time around. I am planning on using it for a pie of some sort for an early Thanksgiving get-together next week, though, so thank you, Summer and Alice! Instead, I’m going to try a Scottish shortbread recipe I found off About.com that is purportedly from Joy of Cooking. For some reason, just reading it made me feel like it was the right recipe, so I’m going to try another test batch and see what happens. Ever had a hunch like that? Sometimes it works, sometimes it doesn’t… I’ve learned to trust myself when it comes to this, though, so hopefully my hunch is on the mark. I’ll definitely let you know what comes of it! p.s. I also promise that eventually, I will stop changing my blog layout and just stick to one. I swear. Eventually.